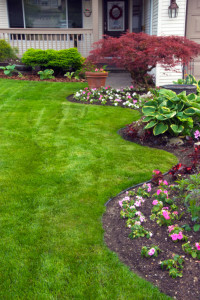 Home » Get a Professional Lawn Maintenance! Mowing and watering from time to time is not enough if you want to have a healthier and greener lawn. You need a regular lawn maintenance service to take care of the weed and make sure the lawn doesn’t grow too much. Phipps Landscape knows best how to treat your lawn properly. We have been serving the residents of Rollinsford, NH for more than a generation. Patience and hard work are not enough to keep your lawn green and full of life. You need to have the knowledge to do it right. With our vast experience we can proudly say that we are familiar with all the details there are in lawn maintenance. Did you know that there are things such as soil acidity, PH levels and many more special elements that need to be considered, in order to treat your yard properly and achieve maximum results. We can come and take samples of the specific soil that is in your yard in order to determine the most appropriate way to treat your lawn. Phipps Landscape is the professional landscape contractor that you need at your side to ensure your lawn is always lush and green. We have all the needed tools, equipment and most importantly skills, to make any garden beautiful again. Our experts will fertilize your lawn and eliminate any dangerous diseases or insects, without using any chemicals that could be harmful for your pets or plants. Give us a call at (603) 742-3500 to schedule an appointment with our professional landscapers. Despite our great experience and high quality of service we strive to maintain the lowest possible prices. Be sure that your budget will remain balanced, because our prices are very competitive. We believe that everyone should be able to enjoy a beautiful and healthy lawn at affordable prices. Don’t waste your family time during the weekends mowing your lawn. Leave it to the professionals, just sit back and enjoy the results. Call us now at (603) 742-3500 and experience our service first hand.